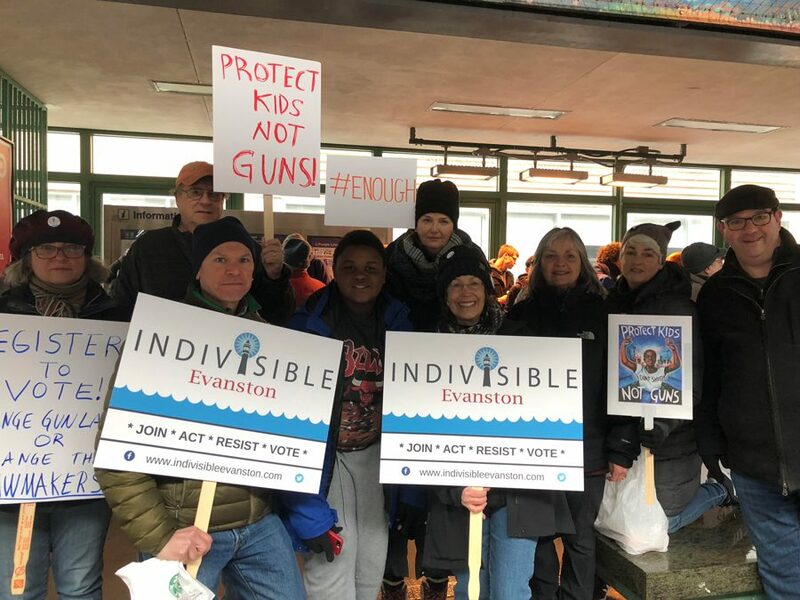 Indivisible Evanston volunteers at the Davis Street CTA station. Volunteers helped with voter registration at the March for Our Lives in downtown Chicago. While Americans gathered in cities across the country on March 24 to protest gun violence and advocate for gun control in the wake of the Parkland, Florida, school shooting, Evanston and other North Shore residents also took activism into their own hands. Many locals ventured into downtown Chicago for the March for Our Lives, including Linda Tate (Weinberg ’76). Tate attended the event as a representative from Indivisible Evanston, one of more than 5,800 Indivisible groups nationwide that formed in the wake of the 2016 election to resist a conservative agenda on local, state and national levels. Tate said volunteers with Indivisible Evanston traveled downtown with other residents and set up voter registration booths in an effort to help the march’s student organizers. She said the Evanston community should be concerned with gun violence, even if residents don’t think they are directly impacted. The city has seen its share of tragedy, including the recent shooting death of Evanston Township High School graduate Yakez Semark on Feb. 8. “I’m a mom always first and foremost,” Tate said. “The idea of gun violence affecting one of my children is just frightening,” she said, adding that she thinks gun laws need to be stricter, especially after Parkland. She said although local Evanston officials are doing a good job to ensure gun safety, residents still need to hold elected officials and police officers accountable for safe gun practices. Tate also said it is important for Evanston residents to understand their “white privilege” and view the gun control debate from different perspectives. Evanston resident Frank Koppelman organized a local march in Evanston for residents of The Mather, a senior living community. He said around 85 Mather residents marched from their location at 425 Davis St. to Fountain Square, with more people joining in the march along the way. Once at Fountain Square, he said there was a rally where residents gave speeches and led chants. Jacki Krashin, a Wilmette resident who participated in a local march, said gun control has always been an important issue for her. Krashin is involved with the Evanston chapter of Moms Demand Action, a group which advocates for common-sense gun reform. As a parent of elementary-school-age children herself, she said the Parkland shooting was “so upsetting,” and compelled her to further advocate for change. Although she is a new member of Moms Demand Action, Krashin said she has already begun to see increased interest in the group since the Parkland shooting. Tate called the march “powerful,” and said it is just the beginning of a larger movement.